Sevoflurane is unstable in soda lime, producing Compound A (lethal at 130-340 ppm, or renal injury at 25-50 ppm in rats; but incidence of toxic [hepatic or renal] or lethal effects in millions of humans are comparable to desflurane). Compound A concentrations of 25-50 ppm are easily achievable in normal clinical practice. Sevoflurane package insert recommends avoiding FGF at 1 L/min for no more than 2 MAC-Hours (2 L/min FGF can be used indefinitely). Carbon monoxide is produced by (desflurane > enflurane > isoflurane) >> (halothane = sevoflurane). Worse in dry absorbent. So turn oxygen off at end of case, change absorbent regularly, change if FGF left on over the weekend or overnight, and use low flows (this will tend to keep granules moist). Spiralith has lithium hydroxide (rather than calcium hydroxide) as its main constituent. Spirolith is a unique absorbent which is efficient, and does not degrade volatile agents. It does not desiccate since its water content is chemically bound. Spirolith is a powder enclosed in a polymer sheet, making the absorbent recyclable, and also limiting the danger to eyes and skin posed by dust in traditional absorbents. Since it lacks a color indicator, it may only be used with FICO2 monitoring. Both Litholyme and Spiralith were found to be quite efficient in Aisys canisters (J Clin Monit Comput. 2016;30:193). Lithium hydroxide is a mature technology with a long history of use in space and submarine environments (though somewhat new in anesthesia applications). Eliminating the activators entirely produces an absorbent which has similar physical characteristics (but perhaps less carbon dioxide absorption efficiency), as compared to soda lime: Amsorb (Armstrong Medical Ltd., Coleraine Northern Ireland). Drägersorb 800 granules in CLIC absorber on Apollo. Click on the thumbnail, or on the underlined text, to see the larger version. New "house brand" absorbents have been created to help deal with the problems of modern volatile anesthetic (desflurane, sevoflurane) breakdown. "House brand" absorbents made by GE and Dräger have less activator currently; especially less KOH. Dräger makes an absorbent with decreased amounts of NaOH, and no KOH (Drägersorb 800 Plus) and an absorbent which (it is stated) will not generate Compound A under any circumstances (Dragersorb Free). 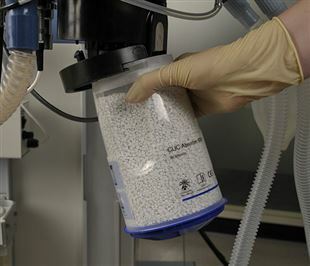 GE makes Medisorb, which also has decreased amounts of strong bases. The canisters which fit on the Aisys and Avance are filled with Medisorb. Baralyme (Allied Healthcare Products Inc, St Louis MO) was withdrawn from the market worldwide in 2005. The - activator was Ba(OH)2 octahydrate; no hardeners, slightly less efficient. Colorless or pink changing to blue-gray with exhaustion. * The water in Spiralith is chemically bound, so it does not dessicate. It does not have a granular size, since absorbent powder is encased in a polymer matrix, and it does not have an indicator. #1 is called the first neutralization reaction. In #3 the second neutralization reaction and the regeneration of activator take place. CaCO3 is an insoluble precipitate. If present, KOH participates in the reactions above in the same manner as NaOH. Canister Change in Aisys. Click on the thumbnail, or on the underlined text, to see the larger version. 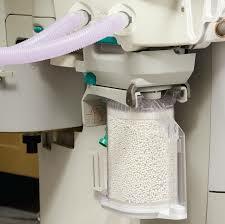 To change the absorbent granule canister on Aisys, press the latch release (arrow at left). The canister will pivot, and may then be slid off its rails (right). A new canister is then slid on, and pivoted upwards to latch. CLIC canister Change on Apollo. Click on the thumbnail, or on the underlined text, to see the larger version. The CLIC canister is changed in a similar way on the Apollo. Steps for changing Aestiva canisters. Click on the thumbnail, or on the underlined text, to see the larger version (23 KB). To change canisters in an Aestiva dual-canister setup, follow the procedure below. Newer gas machines which measure inspired carbon dioxide (often with alarms) allow us to change canisters when inspired carbon dioxide exceeds a known threshold (2-3 cm H2O). NOT dark or cherry-red blood!